Can I really learn one of the 3 most difficult languages in the world? How will I remember all of the insane grammar rules? You're missing out on the fastest and most effective way to learn Russian and you probably don't even know it! Sadly, most people end up following the herd. Meanwhile, using a proven system, the smart ones follow a few simple steps, and within days are speaking and understanding Russian . I'm not talking about some 16 hour a day immersion program, either. They are spending only about 20 or 30 minutes each day. When my clients need to learn Russian fast, I recommend the same method that thousands of successful language learners across the globe have been quietly using. Memorizing countless words, only to forget them because they were not properly cemented into your long term memory. A computer program that flashes pictures and words, but teaches nothing. Listening to 100s of CDs, only to realize that learning a language is actually a very visual process. Wasting hours trying to learn difficult grammar rules, only to realize that's not how a new language is actually acquired. Using the wrong Russian program can be a downward spiral of both wasted time and money. With most of the above methods, you're using old techniques that were never very effective to begin with. And worse, you're not getting feedback on your progress. If you aren't sure you're saying a word or phrase correctly, you're never going to use it for real, once you're in Russia. While you might be able to learn a phrase here and there from any of the above methods, it's not going to truly teach you all the Russian you need to learn. There are proven, scientific methods that exist which can have you learning Russian in days! Go back and read that last bullet one more time. I really want to make sure you get what I said, because once you do, your life will never be the same. Learning Russian will actually become fun and easy. So what's the big secret anyway? It's simply putting the newest, most modern methods of language absorption to work for you. These techniques make words easily stick in your memory, along with Contextual Learning to implant the meaning deep in the language centers of your brain. The technique known as "SLT" will have you thinking like a native speaker, and the concept of Pattern Recognition makes learning grammar practically effortless! Take baseball, for example. Ichiro, arguably the best player to ever step on a baseball diamond, used an innovative technique to develop his vision. He'd stand on the street corner and try to read license plates before the car was out of sight. This superior technique made his eyes sharp to the point of being able to hit the ball practically wherever he wants on the field. He didn't just practice. He practiced correctly. Tiger Woods' father used to intentionally shout, make noise, and jingle change in his pockets to get Tiger to improve his concentration. He hired the best coach, and used superior methods of training. Again, he didn't just practice. He practiced correctly. And so it is with learning Russian. There is a collection of language learning techniques that when used in combination with each other lead to achieving a high level of skill in the shortest amount of time possible. "Instead of struggling to learn Russian, one of the most difficult languages in the world, you can simply absorb it like a sponge!" Contextual Learning Approach - For Long Term Memory Retention. Welcome to Russian Accelerator 2.0 Online! You are invited to discover the brand new course that reveals the ultimate way to learn Russian fast. Russian Accelerator 2.0 Online is an online course that quickly changes you from a total beginner into a real Russian speaker. You Are Designed To Learn Language! Your Brain Is A Language Learning MACHINE! The only stumbling block is that, as an adult, you have mastered English. It stands in your way. Your brain says, Why should I learn a new word for the idea of ‘a street’ when I have a perfectly good one already? Accelerator deals with that reality, and uses it to your advantage. This Is Just The Tip Of The Ice-Berg! The RUSSIAN ACCELERATOR 2.0 Online Course utilizes your knowledge of English through PowerPhrases, and harnesses your natural language abilities with Contextual Learning. With the addition of the Pattern Recognition principle to master grammar, and other innovative techniques like S.L.T., the Russian Accelerator is a powerful force that enables you to learn Russian fast & easy. This system represents years of research and development. Each Russian word is explained in a unique and memorable way. Accelerator doesn't just throw a word at you, leaving you to figure it out on your own. At Russian Accelerator, each word or phrase is covered separately, in a way that's best for English-speaking beginners to absorb it. We've done all the thinking for you. Going step-by-step you'll see how you can master Russian FAST, in as little as thirty minutes a day. Travel to Russia not as a hapless tourist in a foreign land, but as a confident Russian speaker armed with the ability to communicate and understand. Win over the Russian people with your language skills, and be the center of attention. Discover the conversation techniques that will let you deal with any situation you're likely to encounter in Russia. Develop lifelong relationships with Russian people. Isn't that what it's really about? Enjoy the huge advantage you'll be giving yourself by learning Russian. When in Russia you become the go-to-guy, while non-speakers are left to struggle. Read signs, maps, make reservations, easily navigate the streets of Russia... all with total confidence. "I highly recommend Russian Accelerator! It's an excellent course if you really want to learn the language". "Russian Accelerator is the most awesome course and I would recommend it to anyone!" Why we are qualified to teach you about this? My name is Mark Thomson. A few years back, after trying every Russian course on the market, I felt there had to be a better way to learn the language. This started a five year journey deep into the Russian language, and an exploration of how languages are acquired. Together with my team of native Russian speakers and the backing of Unique Digital Publishing, we've crafted what we feel is the ultimate Russian language acquisition program. I live in Russia and can't even count how many times I've seen tourists and others struggle needlessly with the language. I've made it my mission to help these people and to spread the word that Russian doesn't have to be difficult. My assistants are all specialists with expertise in different areas of language acquisition. When putting this course together we sought out the best, and got them on board. This page is about you and your success, not us. The truth is, this is one of the few ways you can finally learn Russian, and fast. In many ways it represents a new era of language learning. If all you're looking for is a few phrases like "Hello," and "Do you speak English?" you should probably look elsewhere. Accelerator is about learning a lot of Russian, and being able to speak and have conversations. Also, if you have trouble following through with things, you may not be ready for a course of this scope. Accelerator does the hard work for you, but you do need to be able to follow the steps as they are laid out. But if you are ready to start speaking Russian, and you are the kind of person who can stick with it, then you'll want to get in on this as soon as possible. You're taking a trip to Russia or Ukraine soon and you need to learn Russian fast. You're communicating with Russians online, or in your personal life, and have reached the language barrier. You've tried other courses and had limited success in learning the language. You have little or no knowledge of Russian but are willing to finally learn. You are ready to set-aside a few minutes each day to practice. You want to learn Russian on your ipad or other mobile device. Finally, you'll want to study Russian a little bit every day, just the way we tell you. It won't take much time...a few minutes here and there. But it's the consistency over these next few months that will turn you into the Russian speaker you want to be. Russian Accelerator is 100% Risk-Free! For a very limited time, we are offering a risk-free $1 trial of Russian Accelerator for 21 days. Why? Because we want you to try the course and see for yourself how fast you learn with Russian Accelerator. We are so confident that you will be thrilled with Russian Accelerator that if at any time you are not satisfied with the training -- while enrolled, or for 1 full year after signing up -- simply ask and you will receive a full refund. We are that confident in Accelerator 2.0, and in people like you who have what it takes to succeed. First, understand that you can try the course for 21 days for $1, before committing to further payments. If you don't cancel you'll be billed four easy monthly payments of just $97. For your four payments, you are getting LIFETIME ACCESS to all of the Online Training: 18 Units, each consisting of 5 lessons -- 90 lessons in all! Plus access to your own personal, native speaking success coach (see bonuses below). The fact is, Accelerator 2.0 is so effective, the first 21 days at $1 might even be all you need! But complete the course, and you become a confident speaker of the Russian language. Remember, if Accelerator isn't everything we say and more, you can get all of your money back. Just call our toll-free number: 877-527-6313 or send us an e-mail to support@RussianAccelerator at any time. Whichever you decide, we part as friends. Four payments of $97, isn't that a little expensive? Before I address that, first understand that by trying it today, you're are committing to just $1 and nothing more. Now let's talk about what it realistically takes to learn Russian and the cost of this course. Would you agree that having the shortest path to speaking & understanding Russian within six months is worth $388? If you are like most people who are getting started with Russian, you are here because you have tried one or more of the alternatives and your speaking ability is nowhere near where you'd like it to be. You may have tried a few low dollar apps, free community sites, podcasts, Skype lessons, some of the famous brand name programs or even a private tutor. But, they didn't really work out for you. So far, not a lot of harm done. But you have lost some time and money, and still can't really speak much Russian. This is a common story among language students, so it's important for you to know that it has nothing to do with your ability to learn a 2nd language. Undoubtedly you've asked yourself, "Is there at least one course out there that does what it promises?" "Will I actually be able to speak Russian in a reasonable amount of time?" The answer: YES, there is one course. And, YES you can do it in 6 months or less! * Russian Accelerator naturally puts words into your long term memory via context and reinforces them with Power Phrases. Learning in context puts the new Russian words alongside the English words you know, making them part of your working vocabulary. This is the exact same way that you learned the words you know in English. The result: Much greater retention and reduced learning time. * With other methods you'll likely be asked to memorize lists of words. You'll also be told word meanings directly which explains the "in one ear and out the other" effect. This is not how the brain wants to learn new words, and is the reason for the frustrating lack of vocabulary retention. * Russian Accelerator has you work with the patterns of how words change. This takes advantage of our brain's highly developed ability to spot patterns. It makes grammar absorption effortless, and is the same reason you don't think about grammar when you speak English. Your brain effortlessly mastered all the patterns of English, and with proper guidance can do the same in Russian just as easily. * With other methods grammar is explained using outdated methods and complicated grammar terms. This is in part how Russian has earned its Category III difficulty ranking: For the average person, trying to remember all those crazy grammar rules and then being expected to use them in natural conversation is overwhelming. This usually makes students reluctant to speak, because they're afraid of making embarrassing mistakes. This results in a huge delay in reaching conversational ability, if not giving up entirely. * Russian Accelerator uses multiple native speakers. This fine tunes your pronunciation as your brain will seek out and adopt the optimal "average pronunciation." In addition, you'll have the opportunity to hear a native speaker of American English, to compare and hear what's acceptable. The fact is, when you learned English as a child you heard the voices of your parents, grandparents, neighbors, friends, and so on. The brain retains language on a deeper level when exposed to a variety of vocal types and tones. * With other methods you'll often only hear one native speaker. This is okay, but not optimal. * With other methods you only learn the general translation of phrases. This is extremely inefficient and often leads to confusion. For example, one of the first phrases you might learn in Russian is, "Minya zavoot Steve." That translates as, "My name is Steve." If you're new to Russian, you'll likely connect "minya" with "my" and "zavoot" with "name." But in this case, "minya" literally means "me" and "zavoot" actually means "they call." So," Minya zavoot ____ " literally means, "Me they call ______ ." not... "My name is _____." By only learning the translation you've lost the opportunity to use the words minya and zavoot, independently in other situations. What's worse is that at some point you will have to re-learn the actual meaning of each word in the phrase. * Russian Accelerator shows you the Super-Literal Translation of every word and phrase. In the case of expressions such as "Minya zavoot ______." in Accelerator you will learn not only the translation, but the literal meaning of all the individual words. You can then use them to create hundreds of new phrases. This phenomenon is known as "exponential usage" and allows you to use each word in a variety of situations, giving you the ability to say more, faster. This technique has you thinking in Russian! * Russian Accelerator requires just a one-time investment of $388 for lifetime access to the course, and one full year of Success Coaching. In 6 months or less, most people have reached their goal of being conversational. They no longer need to spend money on countless books and courses, nor do they have to waste time searching for a method that works. * Private tutors and one on one lessons: At prices between $25 - $40 per hour, you can easily spend over $1500 in just one year. What's worse is, after a year has passed you'll still be stuck at the beginner level due to being taught with all of the traditional and inefficient methods we've discussed above. Considering a local college class? * TIME TO REACH YOUR GOAL: To reach the same ability as you'll get in Russian Accelerator, you'd need to take a minimum of two semesters at college. In other words...one full year. * SCHEDULING: College classes are taught at a particular time on particular days at a particular location. * Russian Accelerator is done at home, on your own time, at your own pace. You log in whenever its convenient for you, from wherever is convenient for you. * TEACHING METHODS: College teachers use the same uninspired techniques that all textbooks use: Memorizing lists of words, memorizing grammar charts, all to pass a test and get a grade. * Russian Accelerator uses proven language acquisition techniques that save you time and make learning Russian effortless. * COST: Even a low-budget community college classes costs $400 per semester. Add in the cost of textbooks, parking, cost of gas, etc and you're looking at a minimum cost of $1000 for just one year. Other brand name courses. There's one CD based course that says you can be speaking Russian in just over a week. Does that sound reasonable to you? I suppose it is reasonable if all you want to do is order coffee. But when you want to converse in Russian with friends, or even with the waitress that brought that coffee, you'll be stuck. Even if you buy their exorbitantly priced premium package of 50 CD's, you're still just repeating after the speaker as you memorize some random phrases. That's not language learning. That's called parroting. After seeing all of the techniques that Russian Accelerator uses for fast language acquisition, does the idea of just listening to some CD's sound like the best way to become conversational in Russian? And the big yellow box? I fell for that one myself. All I can say is, be sure read the reviews before even considering it. There is no teaching in their "method." None. A speaker says something, and you guess which picture they're referring to. Of course, since there is literally no explanation in English, this lets them sell their courses in every country. Great business model. Horrendous way to "teach." Any company that offers "dozens of languages" is obviously using a cookie-cutter approach. We don't. We specialize in language acquisition and Russian. We're experts at both. "I wish I had found this course before I spent $900 on both P. and R.S." "All in all, you did a great job in the design of this course! I wish I had found this course before I spent $900 on both "P" and "R.S. "P." is pretty good, but I have some major reservations with "R. S." Your course beats the hell out of both of them. Another thing that I like about your course is that it's very 'laid back' with some humor mixed into it. This keeps the course entertaining, and of course, motivating. I wish you the best of luck though. Anyway, I'm a pilot that needs to learn some Russian, so I'll be handing over my recommendation of Russian Accelerator to my pilot friends. Best of luck and GOOD JOB!!! " So the question is simple: When you try Russian Accelerator for $1 and confirm that everything I've said about the course is true, ask yourself: Would you exchange $388 (four payments of $97) to be having conversations in Russian 6 months from now? If your goal is to have conversations in Russian, to be able to express yourself, and understand what Russian co-workers, friends, or loved ones are saying, only Russian Accelerator can get you there in less than 6 months, and for just $388. I say that with 100% confidence. No other course can do that. You'll often see claims like "Learn Russian Fast!" but never any proof of technique or path to fluency to back it up. But Mark, what if it doesn't work for me? What if it's not everything you say it is? 1. Pay $1 today and get immediate access to the members area. 2. In a few days you'll be assigned a Success Coach and get an email from her. 3. Sixteen days from now, I'll send you an email with the subject line "Russian Accelerator Billing Notice" to remind you that the end of your trial is a few days away. * If you're enjoying the course and learning lots of Russian, then you don't need to do anything. The first payment of $97 will take place on the 22nd day. * If you're not able to commit to the course, or simply don't want to continue, just respond to that email and let us know. We'll cancel you immediately and you WILL NOT be charged. Remember, the course has a 100% money back guarantee. You can stop at any point. You can even get a refund of any money paid toward the course for up to one year from the date you joined. Simply request it and you will receive a polite and courteous refund. Russian Accelerator is powerful, and it works. But to see for yourself, of course you'll need to give it a try. Here's what people are saying about Russian Accelerator! "Speaking in Russian with complete confidence"
"I signed up for Russian Accelerator a few months back, and now I am speaking in Russian with complete confidence. What's the best part? I'd have to say contextual learning, just because of the way it makes things come naturally." "Your techniques are amazingly effective." "First I want to thank you for making this course available. I've been intimidated by learning Russian for quite some time, even though my boss is Russian and I have ample opportunity to practice daily. I recently began corresponding with a woman in Lugansk and decided I better start learning quickly. Hands down, I didnt think I would progress as quickly as I have, and I knew I was making great progress when my boss raised her eyebrows today when I was speaking Russian with her. Most impressive, I've only studied Unit 1! While I well know I have a long journey ahead, I don't fear the pain I would have otherwise felt. Your techniques are amazingly effective. Feel free to quote me on that." The biggest obstacle most newcomers to Russian face is the daunting Cyrillic alphabet. It’s the #1 reason most beginners get frustrated and quit Russian altogether. Using this new Russian Alphabet Mastery Downloadable version, makes learning Cyrillic a snap! This remarkable training was designed with complete beginners in mind. It uses a new tactic to teach reading and it's ruthlessly effective. You'll be reading Russian in days. YES, it’s THAT good. Please see for yourself! Go to our READ RUSSIAN page by clicking the tab in the top menu. The training videos will have you not just READING Russian, but PRONOUNCING it clearly as well...In just a few days! Once you invest in this course and start using Russian Alphabet Mastery, you'll never have to worry about traveling to Russia, or using some Russian web site. You'll read and understand most everything! You'll feel as confident in Russia as I do! The learning happens automatically, without any effort. You watch, you learn...and suddenly you're reading Russian street signs and understanding what they say. You receive the Russian Alphabet Mastery Downloadable version when you take action in the first 24 hours of reading this offer. Build your confidence by getting invaluable feedback from our staff of native speaking Success Coaches. We are here to assure your success. So we created the Success Coaching program. If you act now, you'll have access to our native speaking coaches Rita, Yana and Dasha as part of the basic Russian Accelerator course. They'll listen to your speech and offer invaluable feedback. For beginners, this is vital to knowing you are on the right track. It will put you at total ease when you travel to Russia, talk with Russians online, or on the phone. We are definitely limiting this aspect of the course, so be sure you get in quick before we're forced to close the doors on this one. Russian Accelerator: On The Go (VOL I) works to maximize your learning time each day, by giving you a powerful Russian language workout when on the go. Burn to CD, or load the files onto your mobile device, and you'll be learning Russian on your commute, at the gym, or any time you're not at the computer. ...increases your vocabulary and improves your communication skills in Russian with the addition of carefully chosen new words and phrases. ...helps develop fluency by incorporating "fluency drills," where the most common phrases and constructions are rehearsed to become second nature. ...fine tunes your pronunciation by having all words and phrases spoken at native speed, and beginner's speed. And, since the training consists of audio files for use on your mobile device, it turns otherwise wasted time throughout the day, into a productive Russian language practice session. Plus, the intuitive, user-friendly layout, helps to maximizes your practice time, letting you easily concentrate on the areas where you need the most work. Frankly speaking, it is the ultimate tool to help you master Russian while on the go. All New RUSSIAN ACCELERATOR PODCAST! Mark, the creator of the popular 'Russian Made Easy' podcast, has made an all new series, exclusive for Russian Accelerator members. Not available anywhere else, each episode features new native speakers, comprehensive course review, new vocbulary and expressions, and long sections entirely in Russian to simulate an immersion experience. ...Master the course material quickly and efficiently. ...Immerse Yourself in the Russian language, thinking and responding without prompts. ...Study Offline able to review the course material without needing an internet connection. The bottom line is this: The absolute worst thing that can happen is you'll learn how to strike up conversations in Russian, how to introduce yourself, how to order food and drinks, and a ton of other cool, useful things, and you'll have learned them "deep", so that you never forget them. For this you will have put up $1 and spent three weeks doing some studying. Three weeks that are going to pass regardless, and a single, lowly dollar that you can get back anyway. Of course, the best thing that happens is you become a capable, confident, well rounded speaker of the Russian language. By now, you've probably realized the fastest way to learn Russian is to apply the newest techniques in language learning. PowerPhrases and Contextual Learning, Pattern Recognition and S.L.T. and the rest. Russian Accelerator Core Online Content: Divided into 18 units, each Unit consisting of 5 lessons, you'll have a lesson to go through every other day. Please note* The $1 trial with "On Sale? You Decide!" promotion is a temporary offer, and may be removed at any time. YES Mark, I too want Accelerator to turn me into a confident speaker of the Russian language. Please let me have one of the 21 day trial spots in the "Russian Accelerator 2.0 Online Training Portal" before it fills up. I understand that you and your team are going to have to prove to me, that Accelerator is all that people say it is. I get to put Accelerator to the test right now for just $1. I want to use Russian Accelerator's proven methods to quickly teach me to speak and understand Russian. If I choose I'll also use the Russian Alphabet Mastery for FREE to learn to read real Russian writing and signs in just days. I'll also have access to your other bonuses regardless of what I decide. 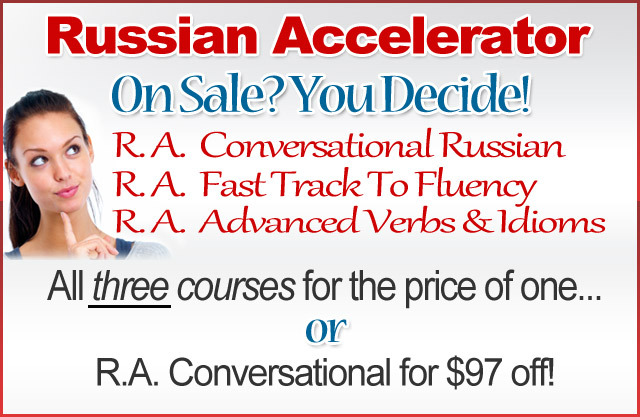 or click the "Add To Cart" button below for the Main Russian Accelerator Course at a $97 discount. If you decide to continue after the trial, this option removes the final payment. P.S., I don’t know when it is you’re looking at this page. For now, the $1 trial and instant download bonuses are all still available. This isn't for everybody. For some, Accelerator may be expensive. As you already know, after the trial period, it costs four payments of $97. The price right there might make it difficult for some people. If you're not sure it can fit your budget, please pass on this offer today and let someone else take your place. Also, please sign-up only if you have twenty minutes or so 4-5 times a week to commit to learning. If you're not able to set-aside that amount of time each day, then you're not ready to learn Russian yet. P.P.S. I know you could take advantage of this offer – grab some training and all the free bonuses – and cancel Russian Accelerator right away. That’s Okay. People like that will only get so far. We're taking all the risk with our one-year guarantee! Let us show you just how fast and easy learning Russian online can be. Go ahead and click the button below to get started! "I would recommend Russian Accelerator to absolutely anybody!" "I'm just so blessed that I've come across this. That's for sure." "With contextual learning it has made the understanding and the grasp of learning another language possible as apposed to what I thought may be, or may have been impossible...It's an amazing course and it"s a...I'm just so blessed that I've come across this. That's for sure...До свидания! Till next time." "I feel like I could travel to Russia right now and communicate fairly well." "I feel like I could travel to Russia right now and communicate fairly well. I look forward to learning more words in the future but, what the Russian Accelerator I think is designed to do is to get you conversational which I feel like I am right now.."
Copyright © 2019 Russian Accelerator - Learn to speak Russian Online - Russian Language Course. All Rights Reserved.